I have been browsing the web for about an hour and a half now, looking for a backpack to use on my voyage. I have literally stumbled across a whole new world, encountering terms such as 'Hydration-Compatible' and 'Spacer Mesh Back Panels'. I didn't know it was going to be this complicated. As you should now know, Gooner On The Road is a backpacking trip with a twist. I have made it my mission to raise £10,000 for the Triple Negative Breast Cancer Foundation. To raise funds, I will be travelling the globe and watching every Arsenal match of the 2013/2014 season, couch-surfing with fellow supporters along the way. By the end of it all, I'm hoping that you, the readers of the blog, and my upcoming hosts, will understand what the 'Gooner Family' is all about, and how you can maybe do something similar. Of course, to even consider pulling off an idea as ludicrous as GOTR, you need to plan. Something that I will admit, I'm terrible at doing. What makes traveling fun is that there is a lot of 'play-it-by-ear'. The beauty of living out of of a backpack is being able to explore the world at your own pace, and go where you want to go. Before GOTR was even conceived, this was the way I was going to travel. However, in order to execute what I had set out to do for the purposes of GOTR, I've needed to make my itinerary look a little more rigid, in order to accommodate every game and make sure that, for example, I didn't have to fly from LA to Sydney in between a Sunday Premier League match and a mid-week Champions League fixture. So with much deliberation I've put together a loose itinerary that should see me meeting Gooners in Poland, Germany, Denmark, Sweden, USA, Canada, Australia, New Zealand, Hong Kong, Singapore, Malaysia, Thailand and Vietnam. To name a few. Most of the Gooners in Europe and the US have offered me some form of hospitality, be it a couch to crash on, or in one person's case, a hotel room! The majority of these Gooners have simply tweeted to say they'd love to see me in their area and are happy to put me up (or put up with me!) for a night or two. In fact, in the U.S and Canada, I've had so much generosity from fellow Gooners that I can make my way from the East Coast to the West Coast by hopping from city to city, taking advantage of America's 'salubrious' Greyhound bus network and staying within a typical backpackers budget (i.e. not a lot!). This, ladies and gentlemen, is the Gooner Family at work. Things don't look so peachy across the Pacific in Australasia and Asia. Sure, members of Arsenal Australia are welcoming me with open arms, but I haven't found any Gooners in New Zealand, and due to the differences in culture between East and West, I haven't really had any offers from people in Asia, despite the place being filled with supporters. But, I am sure that with a little help from Social Media, and a bit of luck, all that will change. For now though, I'm resuming my backpack research. Without one of those, I'm going nowhere. 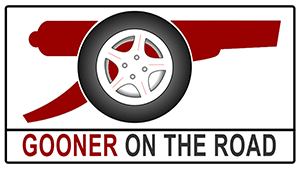 Remember, if you aren't already following me on Twitter, you can find me as @GoonerOnTheRoad. You can also 'like' my Facebook Page. Finally, and most importantly, you can donate to the Triple Negative Breast Cancer Foundation on my Fundraising Page (thanks to all that have donated so far! ).